A Canadian court has granted bail to a former Guantanamo Bay detainee until he completes his appeal against his US conviction. Omar Khadr was convicted by a US military commission in 2010 of killing a US soldier in Afghanistan. Canadian-born, he agreed a plea deal to leave Guantanamo and serve the majority of his eight-year sentence there. Judge June Ross Ross said the appeal was likely to succeed and keeping him in jail was not in the public interest. Khadr will not released until a hearing on 5 May to determine the bail conditions. The Canadian government has opposed his petition for bail, arguing that it would undermine Canada's international obligations. "We have vigorously defended against any attempt to lessen his punishment," said Public Safety Minister Steven Blaney. 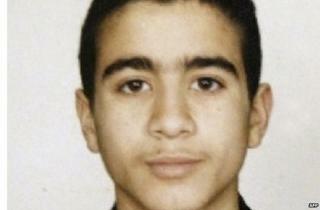 Now 28, Khadr was the youngest prisoner ever detained at Guantanamo Bay. This will be first time he has not been behind bars since he was 15, having spent a decade at the prison in Cuba. He was convicted of five crimes, including throwing a grenade when he was 15 years old that killed Army Sgt Christopher Speer in Afghanistan. Khadr was shot and captured during the 2002 firefight. After eight years in custody he pleaded guilty and agreed a plea deal in 2010 that stipulated he serve one year of his eight-year sentence at the US naval base in Cuba. He now says he only pleaded guilty in order to leave the Guantanamo Bay prison. "Omar is fortunate to be back in Canada where we have real courts and real laws," said Nate Whitling, one of Khadr's lawyers. Canada declined to intervene in Khadr's Guantanamo trial, despite federal court rulings in Ottawa that his rights were violated when Canadian agents interrogated him at Guantanamo Bay. The Khadrs have been called Canada's "first family of terror". Omar Khadr's father, an associate of Osama Bin Laden, took the family to Peshawar in Pakistan to support the Afghan mujahideen in their war against the Soviet Union when Khadr was an infant. The father died in a firefight with Pakistani troops near the Afghan border in 2003. One brother is paralysed from the waist down after being wounded in that same battle. Another has just been released from jail in Toronto after successfully fighting extradition to the US on terror charges. Omar Khadr's sister, Zaynab, and his mother, Maha, are well known in Canada for their radical views.